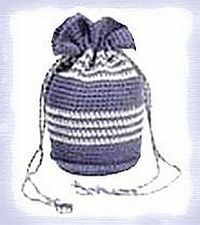 This is the sort of classic crocheted drawstring bag that has many uses; for many years, my mother rolled leftover bits of yarn into small balls and kept them in a bag just like this one. With CA ch 6; join with a sl st to form a ring. Rnd 1: Ch 3, 17 dc in ring; join with a sl st to top of ch-3. Rnd 2: Ch 3, dc in same st as joining, * 2 dc in next dc; rep from * around; join-36 sts. Rnd 3: Ch 3, dc in next dc, 2 dc in next dc, * dc in next 2 dc, 2 dc in next dc; rep from * around; join-48 sts. Rnd 4: Ch 3, dc in next 4 dc, 2 dc in next dc, * dc in next 5 dc, 2 dc in next dc; rep from * around; join- 56 sts. Rnd 5: Ch 3, dc in next dc, * dc in next 8 dc, 2 dc in next dc; rep from * around; join-62 sts. Rnd 6: Ch 1, sc around post of the ch-3 from the back; rep from * around; join. Rnds 7-10: Ch 1, sc in each sc around; join. Rnd 11: Ch 1, sc in each sc around to last sc; draw up a lp in last sc, drop CA, with CB yo and through 2 lps on hook-sc-color change made; join. Rnd 12: Ch 1, sc in each sc around changing to CA in last sc; join. Rnds 13-18: Rep Rnds 11 and 12 three more times. Cut CB at end of Rnd 18. Rnds 19-24: Work 6 rnds even in sc with CA. Rnds 25-32: Rep Rnds 11-18. Rnd 33: Work 1 rnd even in sc with CA. Rnd 34: Ch 4, skip next sc, * dc in next sc, ch 1, skip next sc; rep from * aound; join to 3rd ch of ch-4. Rnd 35: Ch 1, 2 sc in each sp around; join-62 sc. Rnds 36-39: Work 4 rnds even in sc. Rnd 40: Ch 1, * sc in next sc TO THE RIGHT; rep from * around; join. Fasten off. Drawstrings ( Make 2): Cut 5 yards each of CA and CB. Knot ends tog and make a twisted cord. Weave cord through ch-1 sps of Rnd 34; knot ends of cord tog. Pull cords in opposite directions to close purse. Place plastic lid in bottom of purse for added strength. Copyright © 1999, Coats & Clark, Inc. All rights reserved. This site is not endorsed by Coats & Clark.